Charting Courses for Excel provides three distinct download packages containing course material and Excel workbooks for charting. 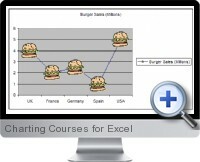 The charting courses first run through step-by-step for Excel 97-2003 users and then Excel 2007 and later. Beginner - Creating a combination Column and Line chart. Intermediate - How to use custom data markers in XY-Scatter and Line charts. Advanced - Creating advanced charts including bullet charts, labels on charts, pictures, gauges, conditional data markers, in-cell charts and more.